ABERDEEN PROVING GROUND, Md. — Future American Soldiers will be better protected in combat by stronger and lighter body armor thanks to innovative work at the U.S. Army Research Laboratory. Materials science engineers are using nature as the inspiration for breakthroughs in additive manufacturing. "You have ceramic armors processed typically right now with dry powder and with hot pressing or sintering — we're able to get really good properties and what I mean by those properties I mean really high theoretical density," Vargas-Gonzalez said. "These particles are able to sinter well and you're getting something that's about 99 to 100 percent fully dense because porosity is one of the main deficiencies of ceramic armor when it comes to being able to withstand threats." Pelz said he came up with the concept during his undergraduate studies at the Colorado School of Mines. "I started working on this project to create next-generation antennas with graded structures and then transitioned into using armor ceramic materials such as boron carbide and silicon carbide and trying to produce parts that had a gradient or internal structures impossible to produce with traditional ceramic forming techniques," Pelz said. 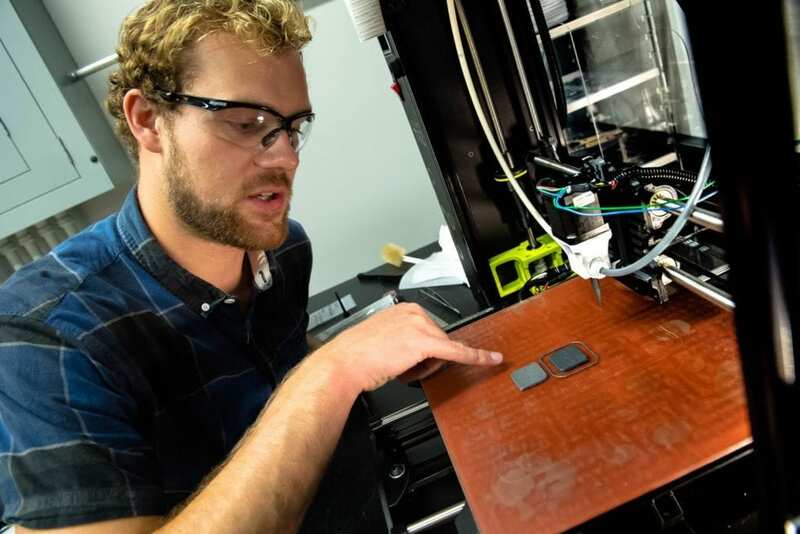 "I hope to use this system that I've designed, as well as the processing of creating these armor ceramics and creating armor ceramic composites to develop both next-generation armor, but also apply it to various other fields such as a biomedical implant," he said. "You could use this same system to produce ceramic implants for say a hip replacement or a knee replacement you could produce the ball that would be put into that that hip joint to actually produce those parts. And so this system gives the ability to produce graded parts — composite ceramic parts — for really any application with any material.